Now You're Cooking with The Adam Glass, Vol. 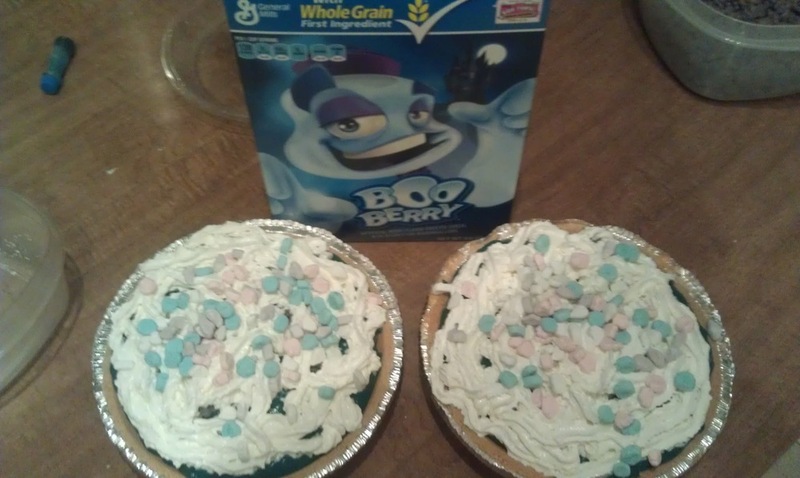 1: Booberry Pie! It's Halloween, kids! And that means that the ingredients to make my third most favorite pun-based dessert are now readily available! I'm so excited that I've decided to kick off a new segment for With Two Brains where I share with you some of my favorite recipes, and to start things off we've got Booberry Pie! This is the hardest part, since even when Booberry is available in the weeks prior to Halloween, it's still hard to find. Protip: Meijer Stores occasionally have it as late as December, which is when I normally make Booberry Pie, because why should I let General Mills dictate what holiday I consume puns on? 1 Can Rediwhip style canned whipped cream. You can use Kool Whip if you want to make things difficult. 1 Premade Graham Cracker Pie Crust, unless you want to make a Booberry Crumb crust, the directions for which are at the end of this recipe. The heart shaped mixing bowl is optional, but I found it in my cupboard. I assume it is a gift from heaven, or my roommate's girlfriend. Either way the pointy side makes it super easy to pour later on. Step 2: Separate the Booberries from their marshmallows. This is the second hardest part. I suggest finding children to do it. Children like doing mindless menial labor, right? Step 3: Prepare your pudding! And make it blue! I'm making two pies here, so I'm using two boxes of pudding and about 5 cups of milk. Whatever amount you use stir the whole bottle of food coloring in there, otherwise the end product is going to be way too light. 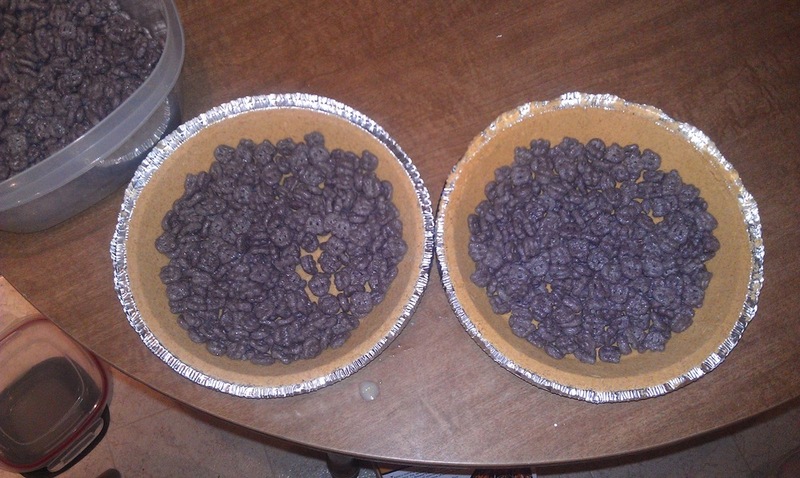 Step 4: Drop about a cup of Booberries into the bottom of your pie crust. Step 5: Pour the pudding into each pie until it's full. If you have extra pudding offer it to the children you forced to separate the cereal and marshmallows in Step 2. 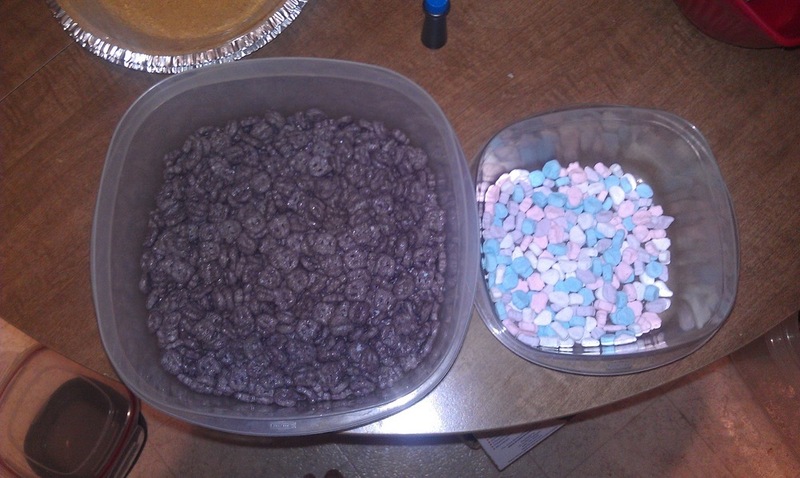 I went ahead and dropped a few more Booberries on top because I'm not going to eat the rest of that cereal on its own. Step 6: Cover in whipped cream then sprinkle marshmallows on top. I like to let it sit in the fridge overnight before serving, which gives the Booberries time to start to soften in the pudding and the marshmallows time to completely dissolve into the whipped cream. It looks monstrous. If this recipe seems like too little work to you, then you can make this alternative pie crust. First crush enough Booberries to get yourself 1 and 1/2 cups of crumbs. I suggest putting cereal into an open large plastic bag and beating it with a rolling pin. You're going to want to completely pulverize it . Add the crumbs to a mixing bowl with 6 table spoons of melted butter and mix together, coating the crumbs in the butter. Spread that out on to the edges and bottom of a 9 inch pie pan then back at 350 degrees for about 5 minutes. Let it cool before you use it for the pie. Alternatively, if this recipe seems like too much work for you, wait for the next installment of Now You're Cooking with Adam Glass, when I'll show you how to make a dessert I like to call Lazy Cobbler.